Is Administrative Bloat Really a Big Problem? I usually begin talks on my book Higher Education Accountability with a discussion of why accountability pressures now are stronger than ever for much of nonprofit higher education. Not surprisingly, one of the key reasons that I discuss is the rising price tag of a college education. I usually get at least one question from audience members in every talk about the extent to which administrative bloat in higher education is driving up college prices. 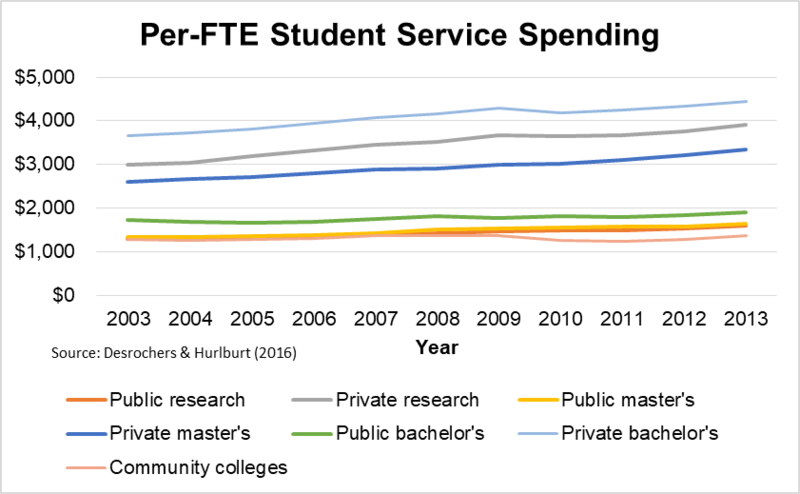 I have written before about how difficult it is to pin the rising cost of providing a college education on any given factor, but I am diving in deeper on the administrative bloat concern in this post. 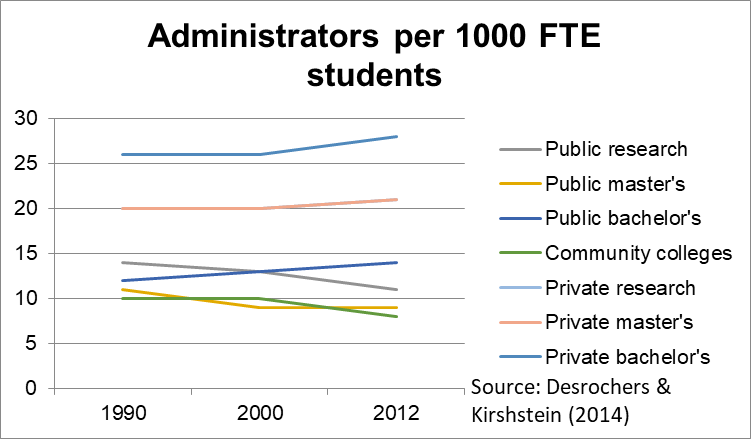 First, let’s take a look at trends in administrative expenditures and staffing over the last decade or two. 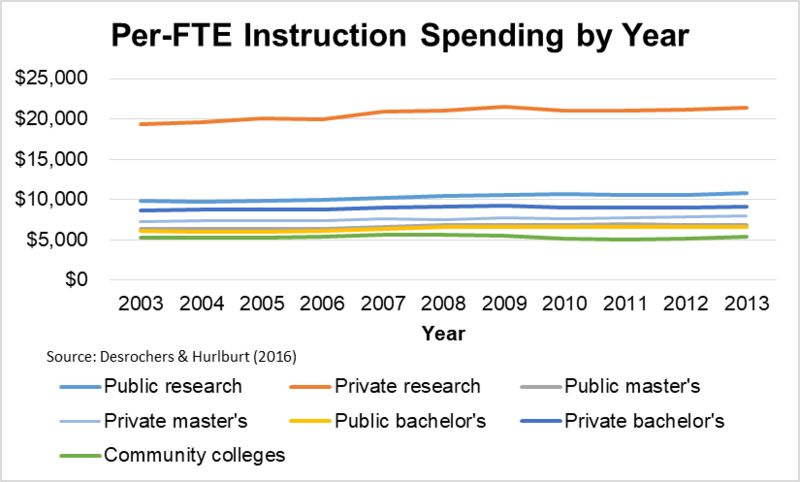 Here are charts on inflation-adjusted per-FTE expenditures for instruction, academic support, institutional support, and student services between 2003 and 2013 (courtesy of Delta Cost Project analyses). 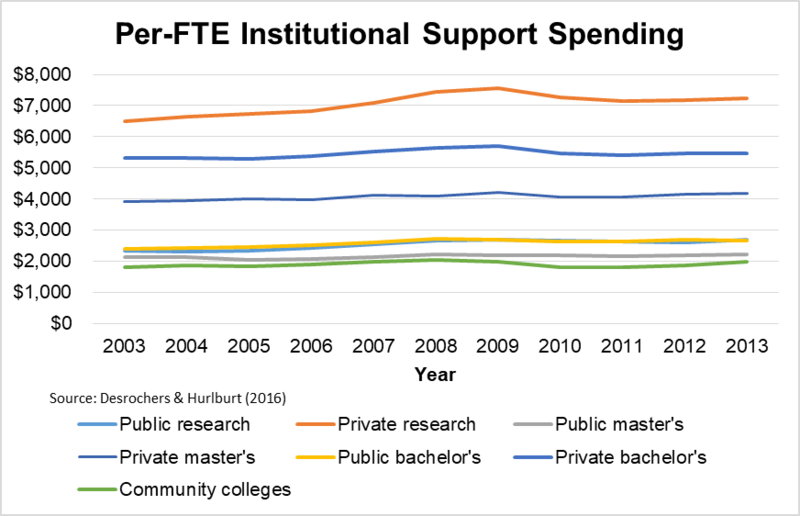 The charts show that spending on student services and academic support increased faster than both inflation and instructional expenditures, while institutional support expenditures (the IPEDS expenditure category most closely associated with administration) increased about as fast as instructional expenditures. 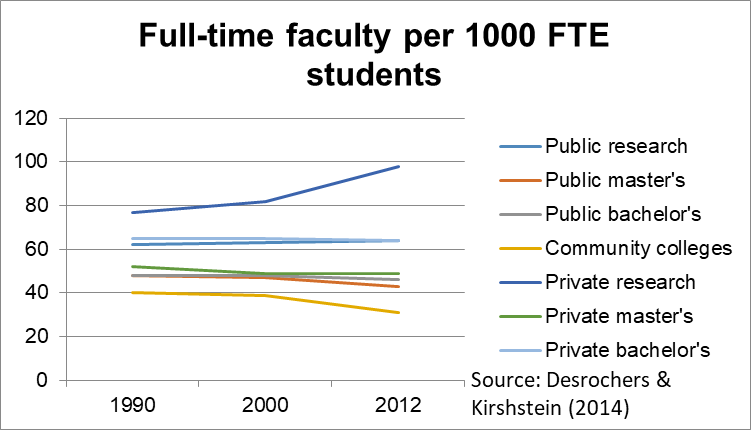 Turning to staffing trends, I again use Delta Cost Project data to look at the ratios of full-time faculty, part-time faculty, administrators, and staff per 1,000 FTE students. 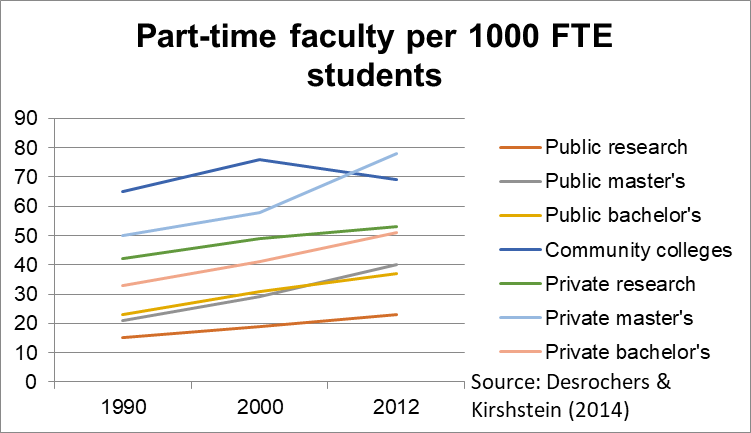 In general, the ratio of full-time faculty and administrators per 1,000 students held fairly constant across time in most sections of higher education. 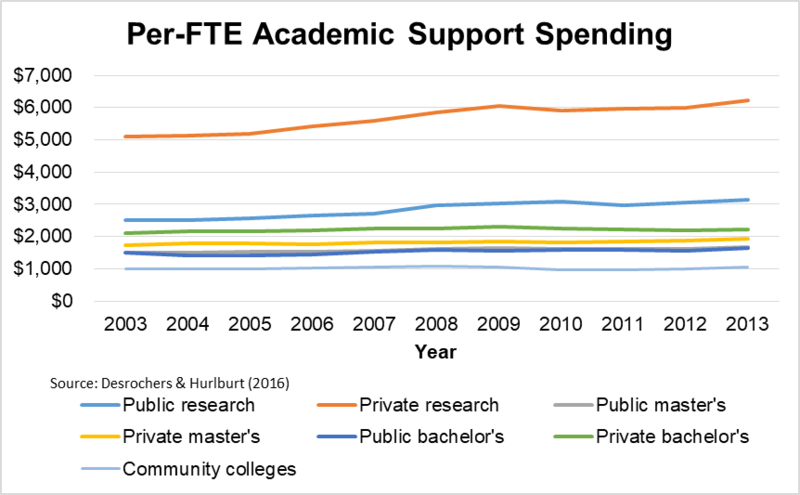 However, the ratio of part-time faculty and professional staff members (lower-level administrators) increased markedly across higher education. The data suggest that there has not been a massive explosion of high-level administrators, but there has been substantial growth in low- to mid-level academic support and student services staff members. 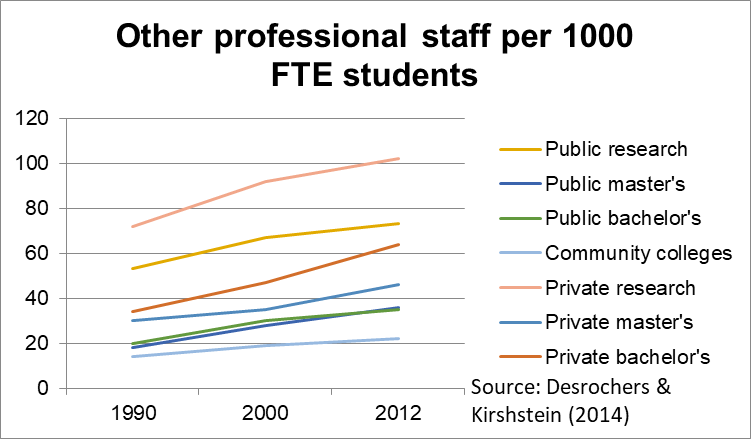 What might be behind that growth in professional staff members? I offer two potential explanations below. In summary, there are lots of gripes coming from both faculty members and the public about the number of assistant and associate deans on college campuses. But most of the growth in non-faculty employees is among lower-level student and academic affairs staff members, not among highly-paid deans. There is still room for a robust debate about the right number of staff members and administrators, but claims of massive administrative bloat are not well-supported across all of higher education. Before 1990 universities didn’t have much of an IT infrastructure. Now the are probably the largest admin departments on most campuses. Then there is grants and contracts regulatory compliance, also miniscule pre 1990 but exploded since. The question should be more like why is admin spending not higher than it is? What was cut to pay for IT and compliance? These are really good points. On the other hand, secretarial support is much less of a thing than it was decades ago because faculty and administrators can do more of their own communication thanks to e-mail. I’d love to see more research delving into this. I’m not deeply embedded in this area, but I think many folks would see it as non-obvious to examine administrative costs on a per-student basis. On one hand it is obvious on further reflection that many kinds of administrative costs should go up when enrollment goes up, but I do wonder whether those costs should be as closely tied to enrollment as hiring of instructors ought to be. I think there is an issue here in the definition of terms. To some faculty, any “office worker” in higher ed who is not directly engaged with students in the classroom might be considered “administrative,” not just deans and associate deans, etc…, but also the academic advisors, student support service providers, and all of their “administrative assistants.” So, I think for many people, administrative bloat doesn’t only refer to upper level management, but to all of the “other professional staff” as well. Each school has its own story. It’s impossible to look at this data and then look at my school and say I concur. We’ve added a huge layer of senior admins in the last 9 years, and they all are paid (minimum) double what faculty are paid. Meanwhile, we have also grown our faculty numbers, but our adjunct pool is bigger than ever, too. That’s a good point. I focus my analyses across broader sectors of higher education, which certainly doesn’t mean that some campuses are not adding large numbers of deans and deanlets. At the CC level, faculty should do most of the advising. Not enough advisors and faculty have a closer connection to the students. Good stuff! Could we see the graphs with the y-axis logged? Previous Previous post: Will The K-12 Teacher Walkouts Affect Public Higher Education?